Kaya, is a local jam made from eggs, sugar and coconut milk, and is flavored by pandan leaves, and later sweetened with sugar. Kaya jam is a very popular spread in Singapore and Malaysia. It was originated from China in the Hainan province. The jam itself tastes sweet and is somewhat creamy, with a hint of coconut and eggs in it. Kaya is originally brown in coloured, however can be artificially coloured into a green spread. Kaya is often used as a spread in breakfast and goes fabulously well with bread that has been toasted over charcoal, and a slab of butter on it. It is an increasingly popular breakfast with Singaporeans, hence the name Kaya Toast. Kaya toast goes along well with a cup of coffee and a plate of soft boiled eggs, which is cooked by hot water. Upon cracking a dash of pepper is sprinkled onto it followed by soya sauce. Kaya toast is made after the cook slices a single piece of toast into half, and spreading a generous amount of kaya followed by a slab of butter. It is then covered up together and served hot. The slab of butter and the taste of the jam is what made this toast popular. Beat the eggs and sugar together with a whisk, mix in the coconut milk and add in the pandan juice. Next, fill the base unit of a double boiler with water and bring to a boil. Add mixture into the top unit of the double boiler, stirring every 10 minutes until the mixture reaches into a smooth consistency. This will take an hour. Cool and bottle up. The kaya can be kept well up to two months in fridge. Tip – to obtain a smooth consistency, use hand held blender to blend the kaya. Where can I get freshly pressed pandan juice? Are you residing in Australia? There are fresh pandan leaves available from some Asian stores. Otherwise, you can use Pandan essence. I am a Sporean , currently living in Auckland . I saliva as I look at your recipes . I did the kaya , I use 6 eggs , 230ml coconut milk , 220g of sugar , 1/4 cup of pandan juices ( extracts from frozen leaves.). As I stir the mixture, it starts to curdles , so I use hand held blender , it looks smooth . Its looks like creme burlee after I leave it set in fridge .. ha ha . Not sure if I over cook or use too much egg . You’ve done it right. Congratulations! I’m from Myanmar. I’m really like your Kaya recipe. I’m going to open the waffle shop in my country on 2012. Thank you so much. May god bless to always. Lovely recipe…want to give this a go. Do you where I can find pandan essence in Auckland….been trying to find this for some time and can’t even find in Chinese Supermarkets. Sorry I wouldn’t know where to find the essence in Auckland. I reside in Melbourne. how many leaves did you use to extract 20g pandan juices? the method did not say when to put the pandan extract. so when exactly do i put the pandan extract? thank you! I don’t have a double boiler, would it be okay to cook this straight from a stove top? My stove is the kind with heating elements. My kaya worked out well – all thanks to you! I used a really big pan and put a pot on top of it. Everyone loved it and its all gone now except the one jar that I saved for myself. Sad thing is, I forgot to put it in the fridge for one whole night and day and I noticed that it’s more watery and there is a little bit of tiny little white things at the side of the jar. Does not look like mold or anything, looks more like the offset of the coconut, is it still edible or should it be thrown out!? Thanks for the recipe. Loved it but was lazy to stand there stirring for an hour plus. So what I did was to put the blended mix into a glass dish and steamed it for 2 hours. Beautifully done. Before transferring to bottles, I used my hand blender to make it into a smooth paste. I prefer it that way. try steaming it. Works well and doesn’t need me to be around in the kitchen till the timer rings. Hi. Thanks for this recipe. I must have put the double boiler on too high heat as it cooked (curdled up) within 20 minutes and I was stirring constantly during this time. It split into curds and water which I strained out. Then I put the strained kaya into a blender to smooth it out. Tastes great but a little grainy. Hope to lower the heat next time. Nonetheless, I’m sure it will all disappear in no time and is so yummy on toast. 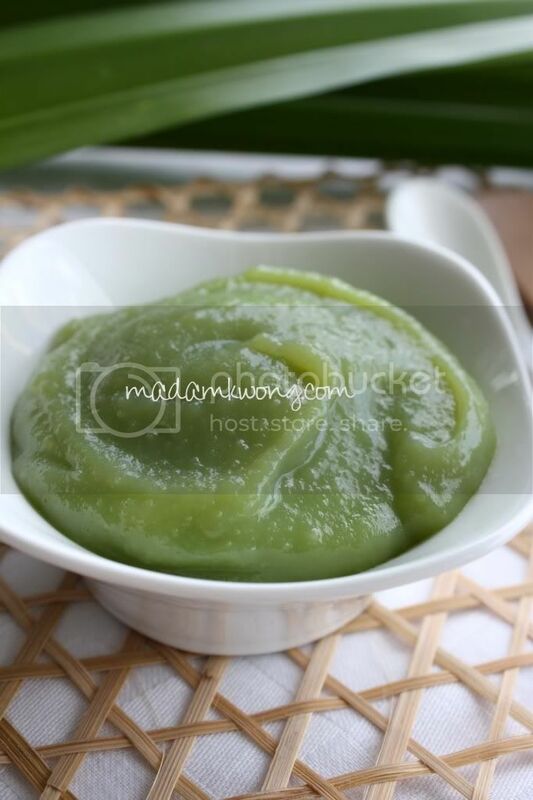 How do you extract juices from pandan leaves? Many thanks. Hi Jing, you need to blend the pandan leaves, add some water and strain. is fresh pandan better then essences? if I use essence how do i mix it? Thanks for the lovely recipe, turned out fabulous! I am a Malaysian currently living in Ireland and been craving for kaya. Tried ur recipe once I chance upon it. Did some small changes though, instead of putting in pandan juice I put the whole pandan leaves in the mixture and discard at the end.I also reduce the amount of sugar as I like it less sweet, maybe bcox of that it turn out more eggy. then finally blending it using a hand blender, turns out really smooth. Great idea, putting the whole leaves in the mixture. I tried the recipe, it seemed very successful, but at the end, the kaya curd up, like small lump. Is it over cooked? Hi Peggy, you may have overcooked it. I think. I am live in Pakistan. There is no available in Pandan Leave. So please tell me Indian or Pakistan name of Pandan Leave. I use a small crockpot( slow cooker) to make this. Just stir twice in between the cooking. After that , just blend the mixture of curds and water. Or you can just sieve it if you don’t have a blender. My recipe uses less eggs though. Dear Madam Kwong, I absolutely love to look at all the recipes posted online and was wondering if you have any plans to expand your business to Toronto, Canada as you would do very well here due to the lack of competition!!! Hi Jen, you should think of moving to Melbourne, would be much easier that way haha! can i made the kaya wity rice cooker?i had cooked with gas stove but very tiring on stirring. I have seen the comment from People Who they have tried your recipe and they all turn out good and I Will try tout make it soon too.I hope it Will turn out as good as in tour picture.Do you have more dessert recipe is made with pandan,because i am crazzy for any thing make with pendant leave.Thankyou. Thanks for the recipe and I am going to make it this Thursday, being a Public Holiday in Singapore. I don’t have a hand-held blender and may I use a hand-held cake mixer instead? May I know how much can I yield from this recipe? I should grind the pandan leaves followed by adding some water and squeeze out the juice, right? I hope to tell you the good news as soon as I have made it.